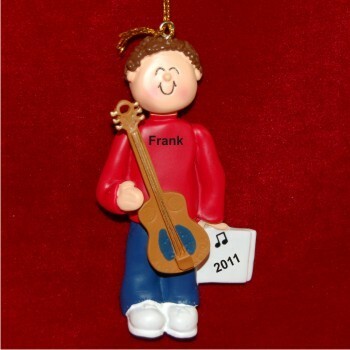 Get a young player started right or celebrate the skills of an accomplished player with the acoustic guitar virtuoso male brown hair personalized Christmas ornament that ships in our plush velvet gift pouch. We take the time to hand letter the details onto this piece, one of many musical instruments ornaments personalized in this series. Use the included golden cord to display the brunette male acoustic guitar player personalized Christmas ornament wherever it brings the most pleasure.